In SOMEWHERE BETWEEN, filmmaker Linda Goldstein Knowlton takes a very personal journey to tell the intimate stories of four teenage girls who live in different parts of the United States but are united by one thing: all four were adopted from China as a baby. As their birth parents could not keep them largely because of China’s One Child Policy, their new lives began halfway around the world in the US and these strong, young women have grappled with what it is like to come-of-age in today’s America as trans-racial adoptees. knowing that they may never completely fit in. They travel to Europe to meet other girls in their situation and then to China where a few of the girls seek out their birth parents, only to witness first-hand China’s gender gap resulting from its One Child Policy and the ramifications it exacts on Chinese families and orphanages. When SOMEWHERE BETWEEN plunges the viewer into the ordinary and extraordinary days of these four young women as they explore who they are, we too are forced to pause and consider who we are – both as individuals and as a nation of immigrants. And as the four girls discover who they are, anyone, no matter their color, creed or culture, will find themselves exploring their own identity and the meaning of family through these insightful girls who seem to overcome the shocking ways women and girls are treated throughout the world to not only set the example, but to also rewrite the rules. 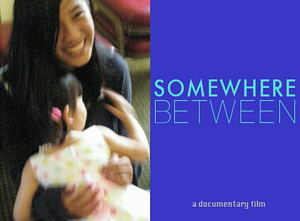 Comments for Somewhere Between – Documentary are now closed.